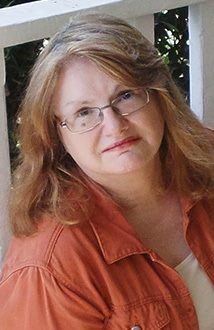 Today on Reade and Write I welcome Ritter Ames for our special Fourth of July edition of the Author Spotlight. 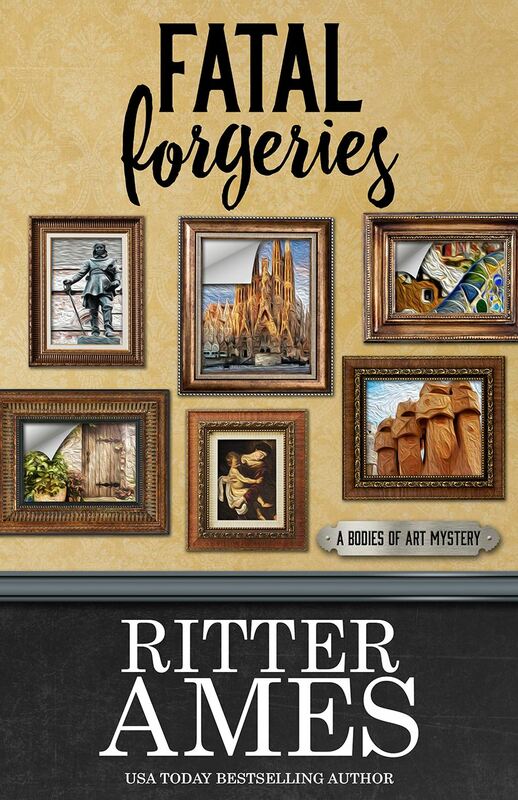 Ritter is the author of two mystery series: The Bodies of Art Mysteries and the Organized Mysteries (I need to run, not walk, to get this series. Organization is often a mystery to me). She’s here today to discuss her most recent release, Fatal Forgeries. Glad to have you here, Ritter! My June 2017 release is Fatal Forgeries, the fourth book in the Bodies of Art Mysteries. It begins with my main character, Laurel Beacham, in the process of rescuing a stolen masterpiece—then everything goes sideways and she scrambles to find a way to get things back on-track. Anyone who likes to read fast paced books with smart characters, quick dialogue, art crime, and amazing settings. Speaking of amazing settings, tell me about the setting of your book—how did you choose it, what kind of research did you have to do, why did you choose it? London acts as kind of the hub for this series of novels. In each title, however, the crimes take my characters to different European locations as Laurel and her crew track the masterpieces and the master criminals. For Fatal Forgeries, the action runs from London to Barcelona and back. Figuring out the title each time, and deciding how Laurel is going to lose her luggage. In a perfect world, I’d love Grace Kelly to play Laurel and Cary Grant to play Jack. I have an idea for contemporary actors for both, but I think I’ll just leave it at that. There are three more books in the Bodies of Art Mystery series, and two books published in the Organized Mysteries, with another to be released soon. I also have another Organized Mystery I’ll be releasing in the coming months, and the first in a new cozy series will be out by the end of the year. Not anymore. I’ve been in three different groups through the years, but between beta readers, my editors, and just really kind of being a veteran of these series by now, I’m out of the group mindset. Yes. A minimum of 1000 words, no matter how hard it is to get them written in a chaotic day. Usually I average about 5000 words a day. I’m a very eclectic reader, but mysteries are my overall go-to. This summer I’m rereading the Jackson Brodie series by Kate Atkinson, but since the 20th anniversary of Harry Potter just passed I’m really tempted to reread that series, too. One author I now have to read as soon as possible is Christopher Fowler, but there are truly too many to name. I dearly love reading series fiction—whatever the genre. When I get invested in characters I want to always know what happens to them next. Switzerland. I’ve never made it there for some reason, but I’ve dreamed about going to that country since the fourth grade. Just write. There will always be someone or something that will try to say you can’t do it. Don’t listen. Anything can be improved with revision, but you must get it written first. Oh, that’s tough. There are three movies I can think of that I ALWAYS sit down and view again when they come on the schedule—no matter how many times I’ve already watched them: His Girl Friday with Cary Grant and Rosalind Russell, Ocean’s Eleven with Clooney & company, and Casino Royale with Daniel Craig. They’re all so different, but they each have the kinds of things I love in characters and a story—the characters are smart & brave & operate with their own personal integrity, the dialogue is fast & witty, and the stories all revolve around a stellar crime. Start writing sooner. And take marketing courses in college! Curious, capable, constant. And no, I didn’t mean to start each word with the same letter, they just came out that way. Ritter, thank you for being my guest today. Amy, thanks so much for inviting me to your blog. This has been fun! I wish everyone in the United States a happy, safe Fourth of July! This entry was posted in Interview and tagged Bodies of Art Mysteries, ebooks, Fatal Forgeries, London mysteries, novels, Organized Mysteries, Ritter Ames, travel. The author spotlight shines on Ritter Ames in this post from the Reade and Write blog. How did I miss the Fatal forgeries series? Thanks, Amy for posting this. Off to add them to my ‘urgent’ TBR list. Is there any other? I’m glad you found more books to add to your list! And yes, they’re all urgent! I loved this book (as I did the other 3 in the series!). The more I learn about Laurel & Jack, the more I adore them. They’ve become like dear friends that I love to hear about their travels. Great interview, Reade and Write reviews! Thank you! I’m glad you enjoyed the interview and I’m happy to hear you’ve read and loved the books! Fatal Forgeries is next on my TBR. Thanks for stopping by! I honestly love starting each new book to find out what they’re going to surprise me with each time 🙂 Thanks so much for stopping by, Kay! London, art crime, smart characters. Sounds like a winning combination and another series to check out. My thoughts exactly, John. As I mentioned earlier, there’s something about an art crime that it just irresistible. Hi, J.R., glad the series sounds interesting to you. It’s one of my favorite combinations 🙂 Thanks so much for stopping by. This was really well done. You have so many comments already. Hope you get to Switzerland. I regret every place I wanted to go to and never made it to. Time goes by very fast. Exactly true–it’s always the things we don’t get done that make us sad later.Thanks so much for dropping by, Linda! Time does indeed fly–I’m reminded that every time I look at a photo of my kids. I hope you get to go some of the places you’ve dreamed of, Linda. Thanks for stopping by and leaving your comment–I hope you have a happy 4th of July! Terrific interview, terrific book. Reading it right now. And just had to post it on Google…. Thanks, Maria! Glad you enjoyed the interview. The book is next up for me as soon as I finish the one I’m reading–I can’t wait! Wonderful interview, and I get the feeling from reading it that like me, you enjoy old movies and some of the wonderful old actors. Your books are going right on my TBR list. I just watched Laura last week, starring Gene Tierney, Dana Andrews, et al. and every time I watch an old movie I fall in love with them all over again. I’m glad you enjoyed the interview, Marja! Thanks for stopping by. Lovely to meet Ritter and learn about her and her books. Thank you! Glad you enjoyed the interview. Great interview. Ritter, I’ve been connected with you for so long on social media but never even knew what you looked like till now. I look forward to reading your work. Art is very intriguing to me. Hi Maggie, thanks for stopping by. I know what you mean about the pictures–I’m often surprised when I just associate people by their FB or Twitter icons then see their photos later. Art–and especially art history and art interpretation–is something that makes me smile. So many great stories come out of a bit of art focus 🙂 Have a happy 4th! Thanks so much for the interview. I have really enjoyed all of Ritter’s books — they are awesome, and I fly right through them! I can’t wait for the next one to be released! Happy 4th! What a great testimonial! I haven’t read them yet, but I have one on my Kindle and it’s up next in the TBR queue. I’m glad you enjoyed the interview–happy 4th to you, too! Celia, that’s so nice of you to say. Thank you! I’m taking today off for the 4th, but tomorrow I’ll be back working on book #5 so it can get turned in for its early August deadline. I love writing this series, and really appreciate knowing people love reading it too. Happy Fireworks 4th! I have actually run into Ritter a few times online, but haven’t yet read her series. I love the “Just Do It” comment… it applies not only to writing, but to everyday life! There would never be a what if in our lives if applied the “just do it” concept! Happy Independence Day! And have a great week! You’re so right about just doing it! It makes life way more interesting, and without regrets. Thanks for visiting and have yourself a great week, too! Hi Sharon, thanks so much for stopping by today. Glad my advice sounds useful. It’s advice I try to follow every day, because it seems more and more like people believe they must give everyone advice to be “realistic.” But too often I find that “realistic” is just another way to say “pessimistic” and keep people from taking a chance on success. Thank you for introducing us to Ritter here, Amy. She sounds like my kind of writer… And reader. I’m smiling at the actors she’d like if her books were made into movies. Ahhh, wouldn’t it be fun? Great advice on writing here. Just do it! By the way Ritter, I have been to Switzerland and my favorite city there is Luzern. I encourage you to go! I’m glad you found a new writer to follow, Pam. There’s something so fascinating about art crimes. And I agree about Grace Kelly and Cary Grant–what a movie that would make! I’d be the first one in line for tickets. Thanks for stopping by and have a happy and safe Fourth of July! Yes, if only we could pull our favorite actors into the present day! Thanks so much for stopping by, and one of these days I’ll make it to Luzern and think of your advice to getting there. It really hasn’t been a conscious decision to not ever make it to Switzerland, but every time we’ve headed for Europe there’s always been somewhere else to go instead, and our trips haven’t been conducive to Swiss sidetrips. Well, if you want any names of hotels/things to do- keep me in mind! My guy and I have spent a lot of time walking Zurich, also, which is a magnificent city.